Based on Patrick Dewitt’s acclaimed novel of the same name, follows two brothers—Eli & Charlie Sisters—who are hired to kill a prospector who has stolen from their boss. The story, a genre-hybrid with comedic elements, takes place in 1851 Oregon. 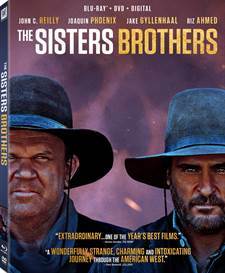 Download The Sisters Brothers in Digital HD from the iTunes store. Listen to the The Sisters Brothers soundtrack on Apple Music. The Sisters Brothers images are © Annapurna Pictures. All Rights Reserved. There was a time in this country when westerns were common fare at cinemas everywhere. However, since before the 1970s interest has waned and it isn't often we get a good old fashioned Western on the big screen. In 2018 writer/director Jacques Audiard (Rust and Bone) brought his version to theaters with The Sisters Brothers starring Joaquin Phoenix (Walk The Line) and John C. Reilly (Walk Hard: The Dewey Cox Story). The film offered a fresh take on the old fashioned western and does the whole genre of justice. If you typically like Westerns you will want to own this one out in stores now. Eli (Reilly) and Charlie (Phoenix) Sisters are two brothers who work for the Commodore (Rutger Hauer; Blade Runner) finding and killing people who owe him money or who has something he wants. After their last kill, they are sent on a mission to work with a tracker named John Morris (Jake Gyllenhaal; Brokeback Mountain). Morris is tracking Hermann Warm (Riz Ahmed; Venom) who the Commodore claims owes him money but the truth is Warm has developed a formula to find gold in the water making it easier excavate. Charlie and Eli are supposed to get the formula and then kill Warm. Along the way, Morris decides to team up with Warm instead of bringing him to the Sisters Brothers and the two set off for California to "dig for gold". However, the Sisters Brothers follow after them, making a few stops along the way including in a town in Mayfield where they kill the "mayor" before they get killed. When they finally meet up with Morris and Warm they decided to join the two looking for gold to get rich. Unfortunately, Charlie gets greedy which has dire consequences for him, Morris and Warm. Audiard did a great job putting together a terrific cast that plays out the drama on screen beautifully. Phoenix and Reilly have wonderful chemistry that makes their family bond believable and Gyllenhaal portrays Morris as an educated and pompous man (which Charlie says as much at one point). Ahmed matches the others well but Hauer is wasted in his role which is nothing more than a cameo at the beginning and end of the film. Adding in a solid script for them to work with and you have a strong movie that is interesting and enjoyable. 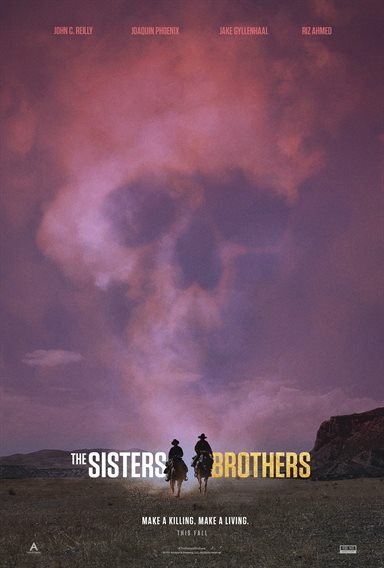 The Sisters Brothers is presented in 1080p high definition video with a 2.39:1 aspect ratio. The wilderness is displayed magnificently with lush greens and dusty browns. The details are sharp and clean. The DTS-HD Master Audio 5.1 compliments the video quality well. The soundtrack is subtle but effective and the gunshots are well mixed. The combo pack offers the Blu-ray Disc, DVD disc, and a digital download. The Blu-ray houses the minimal extras which include: Striking Gold: Making a Modern Day Western, Q & A Panel, Promotional Featurettes (Brothers Forever and Wanted Dead or Alive), Gallery and the Theatrical Trailer. They are interesting enough though rather short in length. While the story gets a little convoluted at times and the ending is more of an unnecessary coda, the movie overall is entertaining especially if you are a fan of the western genre. The cast makes watching the film worthwhile and it has an interesting enough story to warrant watching at least once (maybe more than once to catch all the details). Audiard reminds us why the good old fashioned western should not be forgotten. A director should take on the task at least every few years to bring a western film to the big screen and his contribution to the cause is a strong entry for sure.